Lyn-z-4Jesus: The First 30 Days! Our wedding was amazing! It was all I had ever dreamed of! The day flew by. So, word to those about to get married: enjoy every moment, every detail, and every minute of your wedding day. I can't tell you how many people kept telling us to "take it all in." So many people came to celebrate with us, I was shocked! Old friends, new friends, and family I hadn't seen in a while. Weddings really do bring people together, even if just briefly. The weather was perfect! Go figure, it was 75 degrees on an early January day in Texas! An answer to prayer, as we prayed for no ice! Another memorable moment for me was when my groom came down the ailse to get me, his bride. (We did this as a symbolic picture of Christ, our Heavenly Groom, coming to get us, the Bride of Christ) He cried upon the moment of the chapel doors opening! And though he was supposed to walk down the ailse to get me, he did more of a sprint! He was coming to get me! It was so sweet, and I've never felt more wanted and loved in my life. Thank you, Lord. My sweet husband had one last surprise for me as we prepared to depart the reception, I walked out and to a 1959 vintage, white Rolls Royce named, "Cloud 9". I think that is a perfect way to describe the array of emotions I felt that day. It really was as if we were on Cloud 9! We left the next day for our honeymoon: a 7 day cruise to the Western Carribean. I had no idea where we were going, so that was a fun surprise too! He just told me how to pack. We woke up that morning and just wept again...we couldn't believe we were married & how beautiful the wedding was! All we could do literally was thank God! One of our favorite stops was to Belize. We went on a private island and relaxed, laid out by the ocean, and ate. We even got adventurous and went kayaking! So now it's back to life, back to reality. I've moved all of my stuff over to my new home finally! We have been working on getting our home together and in order. I LOVE this part! My husband has just been singing my praises about how nice our place looks. That makes me feel so good! Some of you who know me and know I cannot cook would be happy to know, I have been in the kitchen burning it up! (Not literally...well just one time I burned our dinner!) We have made a vow to abstain from 'fast food' joints this year (yikes! ), so that means eating lots of meals at home...now, there's a lofty idea! So, what's next for us? I know you guys are all wanting to ask, "When are you going to have a baby?" Isn't it funny how we just keep moving from thing to thing to thing instead of just enjoying the here and now? Next on our agenda is to slow down, enjoy one another, adapt and adjust to married life (in every detail: finances, relationally, etc. ), and to take it one day at a time. So, babies will come in their proper season. We'll leave that up to the Lord and His timing. 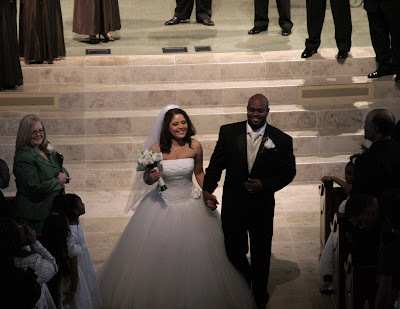 But for now, I just want to sit back and reflect on the first 30 days of my marriage! You looked so beautiful on your wedding day. Congratulations Lynzee. The ceremony and everything leading up to it was so special to be apart of... it was definitely any girl's dream! The pictures are beautiful, but can't capture the joy and hope of the day. May you and your handsome husband enjoy your new wedded bliss. God bless your union.